Hello! Happy Wednesday! I hope you're having a great week so far! Today I have a card using some Taylored Expressions goodies. 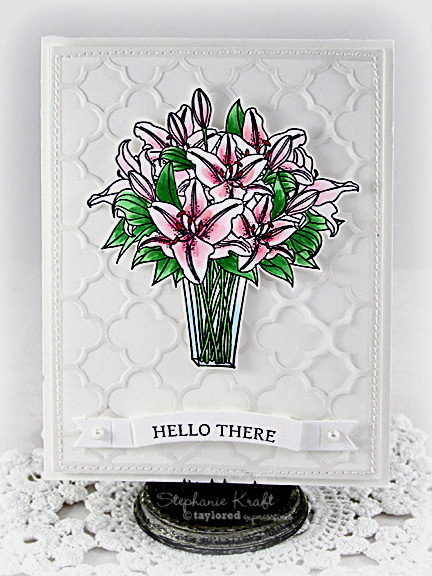 My card uses the Star Gazer Lily Bouquet. I wanted to keep my background simple (yet elegant) to show off the flower bouquet. I skipped using patterned paper and instead used the Quatrefoil Cutting Plate to die cut my background out of vellum. I layered it onto a piece of Choice Snow White cardstock and stitched them together. My sentiment is from the May Stamp of the Month, Cutie Pie, and is stamped onto the banner from Branches, Banner & Bloom. I stamped the bouquet, colored with Copic markers, cut out and popped it up with foam tape. My banner is also popped up for some added dimension. Accessories: Taylored Dies: Quatrefoil Cutting Plate, Branches, Banner & Bloom (Taylored Expressions); Markers (Copic), Snow Pearls (Kaisercraft), Foam tape, Thread, Sewing machine.